The King of Fire is a charismatic leader. He is passionate, and his passion is something others find inspiring becuase is is focused, grounded, and creative. He is the perfect team leader. He can draw to him the people who are necessary for a project to be completed, and every single person will want to play a part to help bring his vision to life. Some may see the King of Fire as an ideas man, but they only have to observe, and they will soon discover that he is very proactive. He likes to be involved, to get his hands dirty, and he will remain involved from inception to completion. The King of Fire is also fearless. Dauntless, in fact. He is lion-hearted, and the vital heartbeat of his court. He is not afraid of hard work, but he also respects and moves through his day with the awareness that he is only a part of the whole. He is a necessary part, but still just a part, and one that can’t be replaced if his ventures fail. This is why the King of Fire works tirelessly to fulfill his role, and, despite his gregarious ways and charismatic nature, is, at the core, a very unassuming and respectful man. It is why he calls upon, and makes use of, those around him. He understands that he is but one man, and in order to rule well he must be willing to delegate, in essence, he must be willing to share his power and his glory with others. If the King of Fire appears in your reading, it symbolizes the wisdom of knowing that even those who are leaders are a part of a team. Every wise leader has people around them who perform tasks that help them to keep things running smoothly. This same wise leader respects their team, and appreciates the efforts made on their behalf. He symbolizes the importance of being interested and involved from beginning to end. He asks us not to start something, delegate, and then walk away. 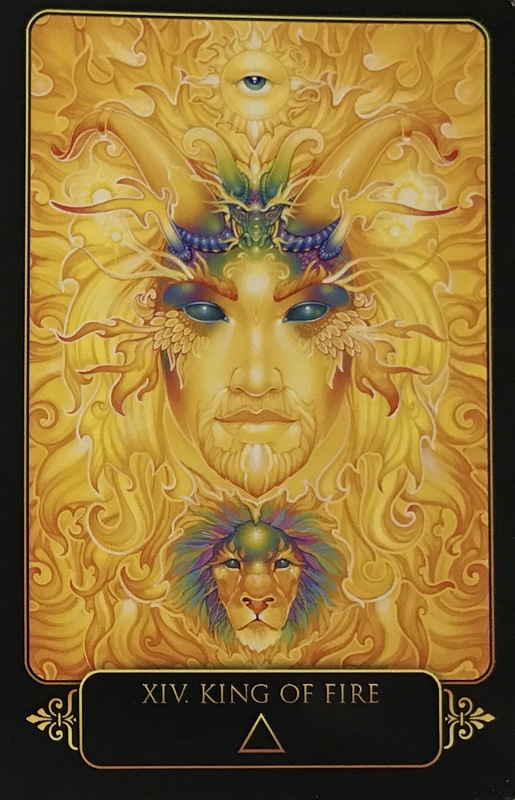 This entry was posted in Artist, Deck Review, Featured Card of the Day, General Tarot, Readings and tagged Dreams of Gaia, King of Fire, Ravynne Phelan, Tarot.